The aim of ÖKOPROFIT is to link resource and economic efficiency in an intelligent way, in other words to achieve active environmental protection with profit. With the help of targeted steps, the project not only reduces the strain on the environment, but at the same time bolsters the businesses and manufacturing companies that take part from an ecological and economical perspective. The results of the 10th round were impressive. Participating companies had successfully implemented 80 planned activities and in doing so managed significantly to reduce the burden on the environment by, for example, cutting CO2 emissions by 780 tons annually. 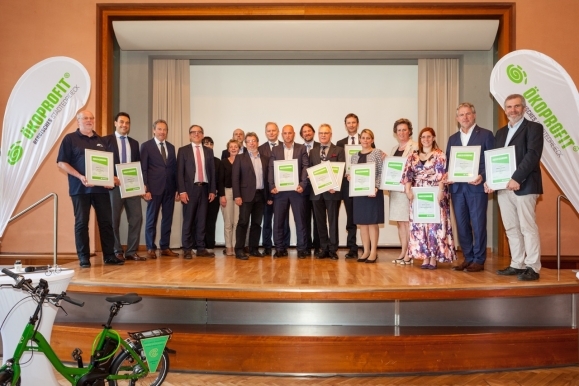 As one of the eleven award-winning organisations, the Historische Stadthalle Wuppertal, scored highly for various construction and investment projects (replacement of the cooling system, LED lighting, kitchen ventilation) and achieved savings of 94.3 tons CO2 and €28,100 per year. Peter Knitsch, undersecretary of the Ministry for Climate Protection, the Environment, Agriculture, Conservation and Consumer Protection for the Land of North Rhine-Westphalia, Andreas Mucke, mayor of the town of Wuppertal, Hartmut Hoferichter, city manager of the town of Solingen, as well as Barbara Reul-Nocke, deputy for Law and Order, Safety and Security of the town of Remscheid, and the chief executive of IHK, Michael Wenge, personally presented the companies with their awards. After the ceremonial presentation of the certificates, the guests were invited to a joint meal to round off the evening.